Loot bags—also called party favors, goodie, or goody bags in many places—have an important place in children’s parties. These little bags filled with small trinkets help cap off the day’s events and are given as a souvenir and an expression of thanks to those who took time to attend the party. The party may have already ended, but your guests will be able to remember it for days on end when they use the items in the loot bag. Obviously, you want your guests to leave with a good memory of your party, and the contents of your loot bags can help make this happen. How can you put together a memorable loot bag? Here are some great items and ideas that can help you get started. There’s no need to fill your loot bags with sweets just to wow kids; you can also give them some non-edible items that they can appreciate. For example, you can bulk order silicone bracelets, lanyards, or cute keychains that are designed especially for the event. Decide early on what the theme of the party will be and ask someone to design the giveaway item with the theme in mind. You can add a few details, like the name of the celebrant and the date of the event, to make it more personal. 2. Arts and crafts materials. Arts and crafts materials also make for a wonderful giveaway. 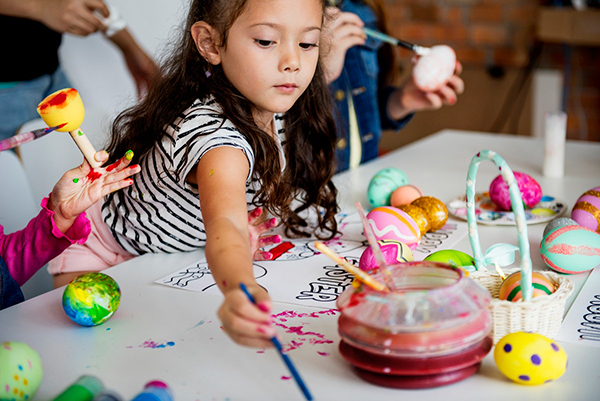 You can add art supplies to the loot bags, or you can schedule an arts and crafts activity in the party and add the finished products to the bags. Either way, your young guests will be happy to receive something that they can use or something that they have made with their own hands and in the company of their friends. If you’re willing to splurge or if you’re expecting a very small number of guests, then you might want to consider giving away big-ticket items. How much each item costs totally depends on your budget and the theme of the party. You can give away video games, building block sets, or dolls, for example. But if you have more guests than expected, then you can raffle out the big-ticket items to lucky guests. 4. Snacks and edible goodies. Sweets and snacks can act as filler items to add a bit of weight to the loot bag. At the same time, they can also serve as the main giveaways. It’s easy to fill your goody bags with store-bought sweets and chocolates, but you can also go with better alternatives like yummy yet healthy snacks or home-baked goodies. Encourage good hygiene practices early on by letting your young guests take home sanitizers, creams, or even lip tints and balms in cute containers. Aside from choosing items with eye-catching packaging, check that the products are made of hypoallergenic ingredients. In addition to toiletries, you can also giveaway small articles of clothing, like colorful socks, themed headbands and hair ties, a set of handkerchiefs, or even reusable bags. To make shopping easier, ask the celebrant’s help when picking the design of the items. While it’s encouraged to come up with a loot bag that fits the theme of the party, there’s really no need to keep everything uniform or consistent. 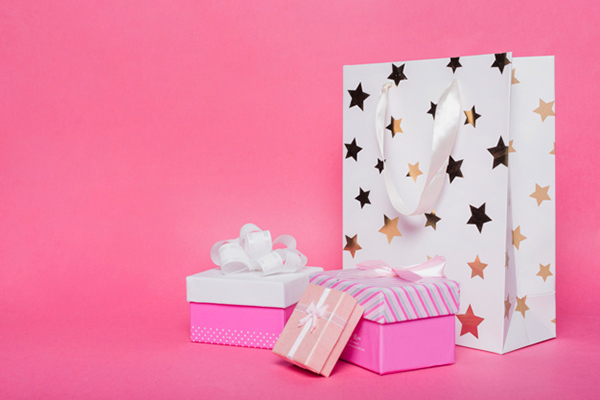 You want a loot bag that everyone can enjoy, so consider the age group and interest of the guests you are trying to cater to when planning the contents of the bag. Also, don’t go beyond your budget when putting the loot bag items together. Remember that the party itself is the main event and should take up most of the budget; the loot bag, so to speak, is just icing on the cake. If you are not a sea lover that means you haven’t been to the Bahamas yet. The glittering beaches of the American sunshine state along the Cuban coastline, Bahamas is a treat for your soul. If you want to do the vacationing in a relaxed luxurious way with sun-kissed mornings and breezy evenings, Bahamas is the place where you should head to. Weren’t you planning a trip with your kids? See what you can do there and you will already fall in love with its beauty! First thing first, the foreigners need a tourist visa. One can reach the Bahamas by flight to Lynden Pindling International Airport of Nassau. There will be many options to go to the main city. Tourists and locals both use buses for traveling with minimum charges of USD 1.25 for major spots and USD 2 for the longer routes. If you want a more relaxed experience, you can go to a rental car or taxi cabs. The two most popular taxi operators are Meter Cab Taxi Service and Bahamas Taxi Cab Union. The rental houses in the Bahamas vary from the expensive luxurious ones to the budget-friendly hostels. Both are pretty welcoming for the travelers. Since you are planning to travel with mommy dear, you would like some complimentary spa, pool, and Jacuzzi in your list. The Bahamas have a plenty of luxurious hotels along the road. You can splurge on the facilities that these hotels will be offering you. The budget hotels are also quite awesome with basic amenities. The planning gives you the adrenaline rush of foreseeing the fun you are going to experience, no? 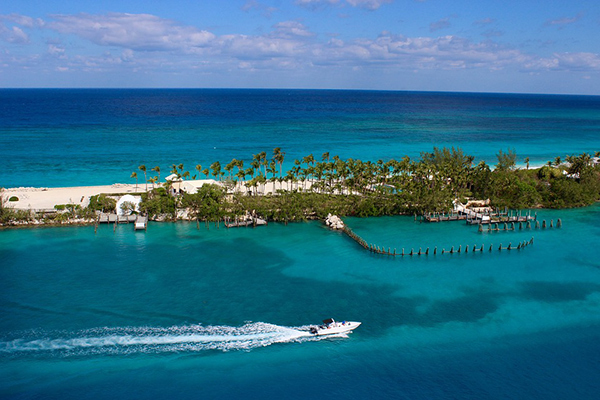 Here are a few places where you must go if you are planning to go to the Bahamas. If you walk a few miles away from the shimmering resorts and flashy casino complexes, you will learn what serenity is in form of the pink sand beach. The east coast of Harbour Island and towards a little north of Dunmore you can see the Pink Sand Beach wondering how beautiful a beach can be. Boutique hotels with palm-topped umbrellas are quite a well-known sight here. Glow in some rose-colored sand and you won’t regret! It used to be the hideout for pirate buccaneers once upon a time. But it became a center for learning diving during the Second World War. Blue Lagoon Island is one of the most preferred destinations for the families who come to the Bahamas. The island is officially known as Salt Cay. 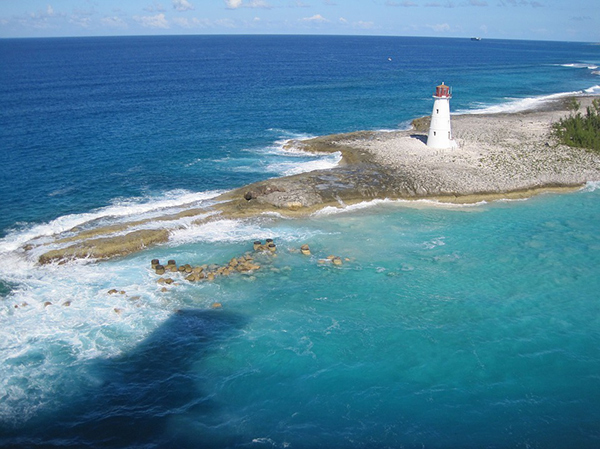 Here you will experience a stretch of white sand and stony McCutcheon’s Tower on one side offering a breathtaking view of the Caribbean glamour! If your checklist has your dream of swimming with the dolphins, get prepared to tick it off. It’s like we never want to grow up, no matter what! If you guys want to go for splashy pools and water slides, Paradise Island Waterpark was just the place you would like to spend with your mom. Some activities are only adults friendly. So what? Now that you guys are here to enjoy more, head to the bars and grotto pools to enjoy. Eleuthera is a paradise to behold. 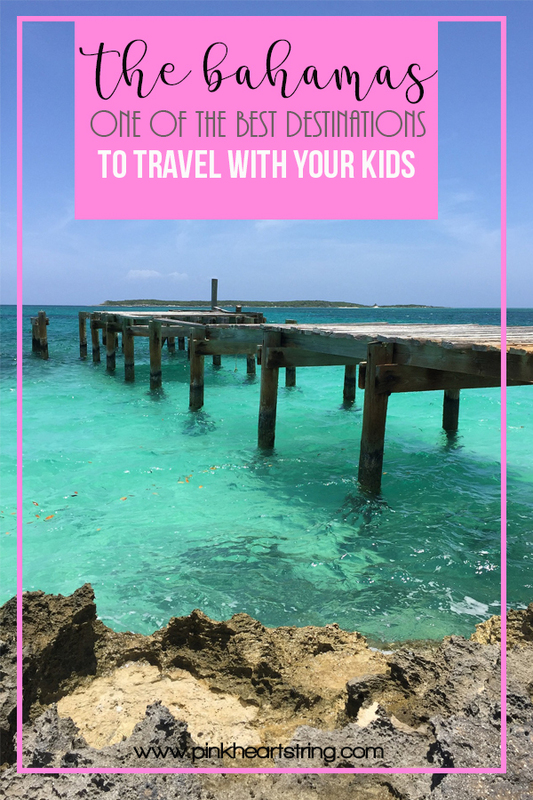 It is a must stay in the list because of its divine beauty and you will never want to miss a complete Eleuthera tour with your mommy darling. It is stretched out in a backward C and covers more than 100 miles from top to bottom. There are many hidden coves and many coastal crevices to explore. There are important spots in the island-like Surfers Beach, Whiteland and Rock Sound. If you are a foodie and if you are looking for the most authentic culinary experiences, Arawak Cay is the perfect place for you. A small walk through the Western walkway of Nassau, Arawak Cay is set out in the sea. What’s big there? The cluster of earthy small barbecue joints offering the mouth-watering and legendary Bahamian Fish Fry. It is always advised to go on a Sunday to experience to the fullest. Are you planning to give your mother an underwater experience? If your mother is adventurous and is ready to try out new experiences, take her to Andros. Though there are plenty of places in the Bahamas where you can go snorkeling and scuba diving, Andros is still the best and the biggest one. Submerged shipwrecks to underwater blue holes, speckled scorpion fish, and blue tangs, from parrotfish and trumpet fish, you will see all of these making Andros a beautiful place to be! A 40-acre land of wild mangrove swamps and beaches, Lucayan National Park is situated in the southern coast of Grand Bahamas. The underwater cave systems are some large, probably one of the largest caves in this world. Tourists with interest in bird watching and interest in a unique ecosystem will love this place of natural beauties. What’s the best way to bond with your mother? Yes, you got it right! Shopping of course! Mother-daughter duo should never miss the shopping gem standing tall on the harbor’s edge of Freeport. It has the classic Caribbean colors like pink, turquoise, yellow and green. There are many boutique shops selling locals straw items. A shopping area is incomplete without food joints and pubs and no wonder why this place is full of such happening places. The island country is ideal for taking your mom out of her daily boring chores and it gives her an experience of what’s called tranquillity! 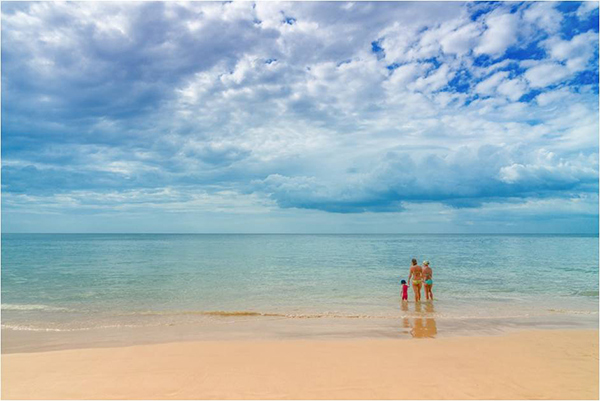 Grab your pen and plan what you should do before you head for your mother-daughter duo trip! When Build-a-Bear announced their "Pay Your Age" promo which allows the customers to buy a bear with the price of the child's age, every parent was full of excitement to go to the nearest store to get one for their child! Well, if there is a store near me, I will definitely be there! My kids are aged 6 and 1. I'd love to buy a stuffed toy priced at $1 and $6! No wonder that parents were queueing in every Build-a-Bear store along with their children. Yes, they need to bring the kids with them because the offer is valid for every guest present in the store. According to the CBS News, the lines were really really long and everyone waited for hours just to avail of their "Pay Your Age" promo which is only available for one day (July 12). This is the first time that Build-a-Bear offered such a promotion and it appears that they did not anticipate such great response! Because of this, many stores shut down and allowed only a certain number of people into the store due to safety concerns. The official website said, "Per local authorities, we cannot accept additional Guests at our U.S. Build-A-Bear Workshop locations due to crowd and safety concerns. We have closed lines in our U.S. stores. We understand some of our Guests are disappointed and we will reach out directly as soon as possible." Some were given coupons to get a discount on their next purchase since they can no longer avail the promotion. Well, it's quite fair enough but I'm not sure if its worth all the effort, time and stress of queuing for hours with children! 1. 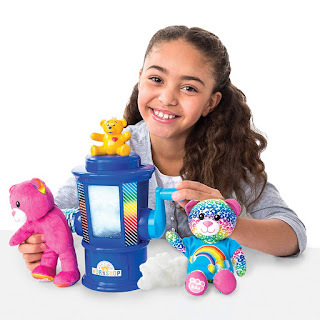 Build A Bear Workshop Stuffing Station by Spin Master. This is originally priced at $29.99 but is currently on sale for $14.99. 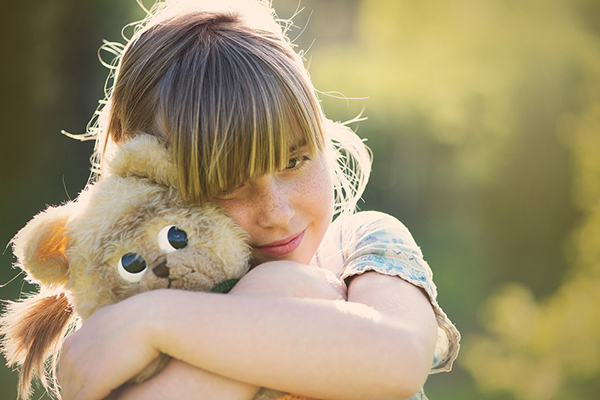 This kit will let your kids make their own furry friends at home! 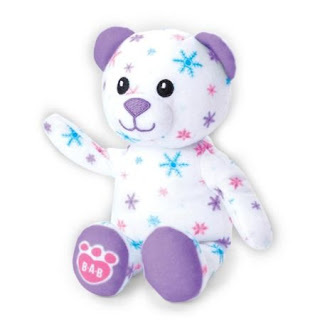 A cute bear with snowflakes on it! It is priced at $12.88 BUT you can get $50 off instantly which means that you will pay $0.00 upon approval for the Amazon Rewards Visa Card! Get it now! Make your own baking bear with this kit. It also comes with some cute clothes. No wonder it costs $19.99 but like the previous entry, you can also get a $50 off on this one when your Amazon Rewards Visa Card is approved. 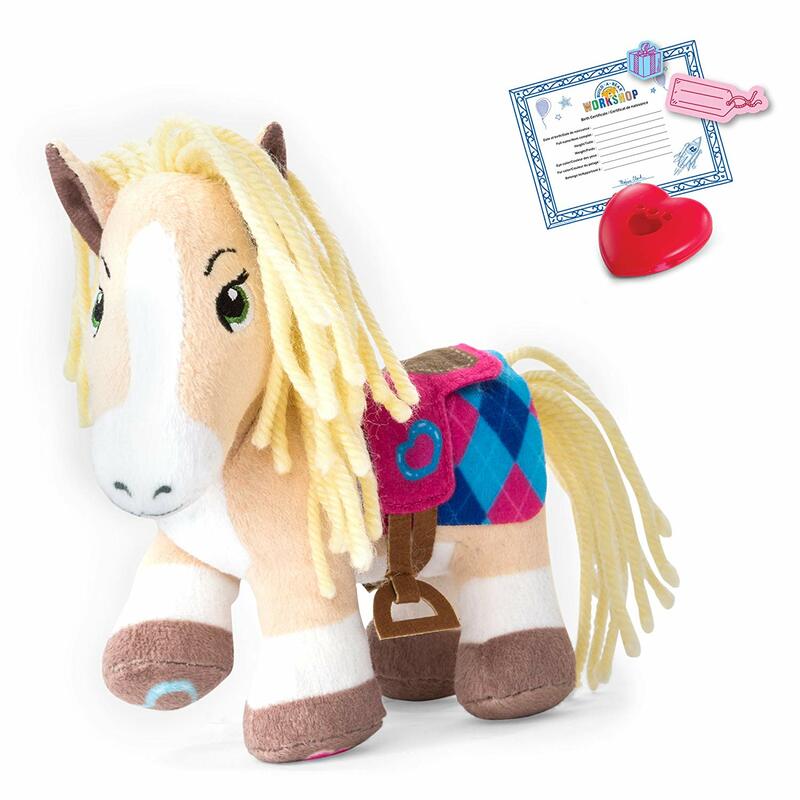 If you have a kid who loves to play with a pony, then this one is perfect! You can get it for $16.98. Get a multi-colored Cheer Bear for this set. 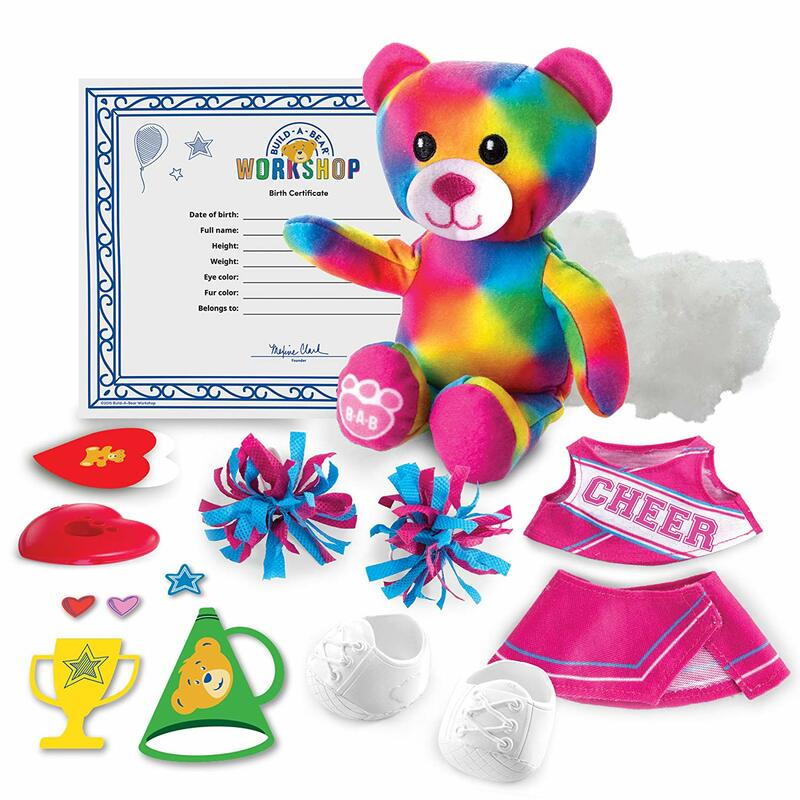 It even comes with pom-poms too so that your bear can actually be a cheering captain! It is currently priced $22.95 but can be yours free with the Amazon Rewards Visa Card. 6. 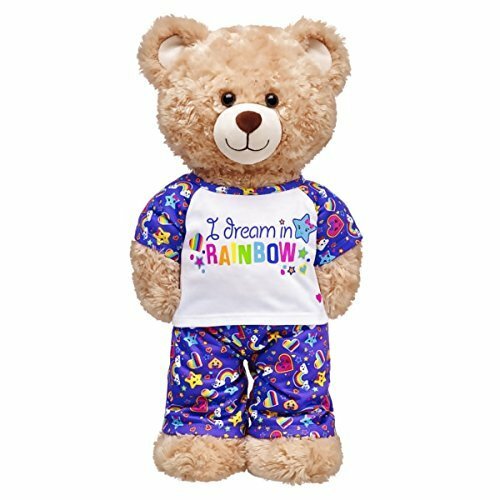 Build A Bear Workshop I Dream In Rainbow Pajamas 2 pc. This outfit will make your bear ready for a pajama party! Get one at $10.50. 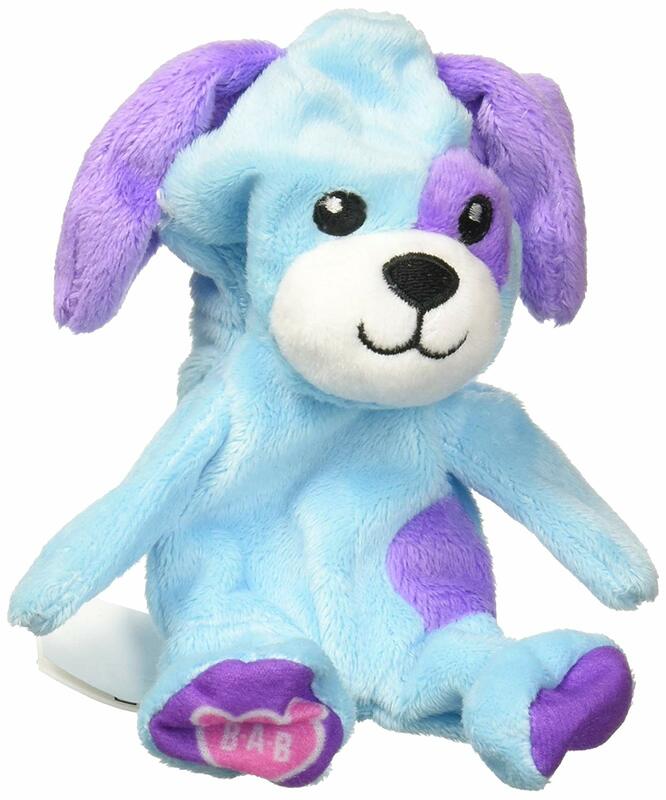 If you have your own Build-A-Bear Stuffing Station, then this refill pack of a cute blue puppy will give you another stuffed toy addition. You can buy this now with a $5.24 savings since its currently on sale at $14.75. Isn't she cute? Love her dress and the cupcake she is holding! 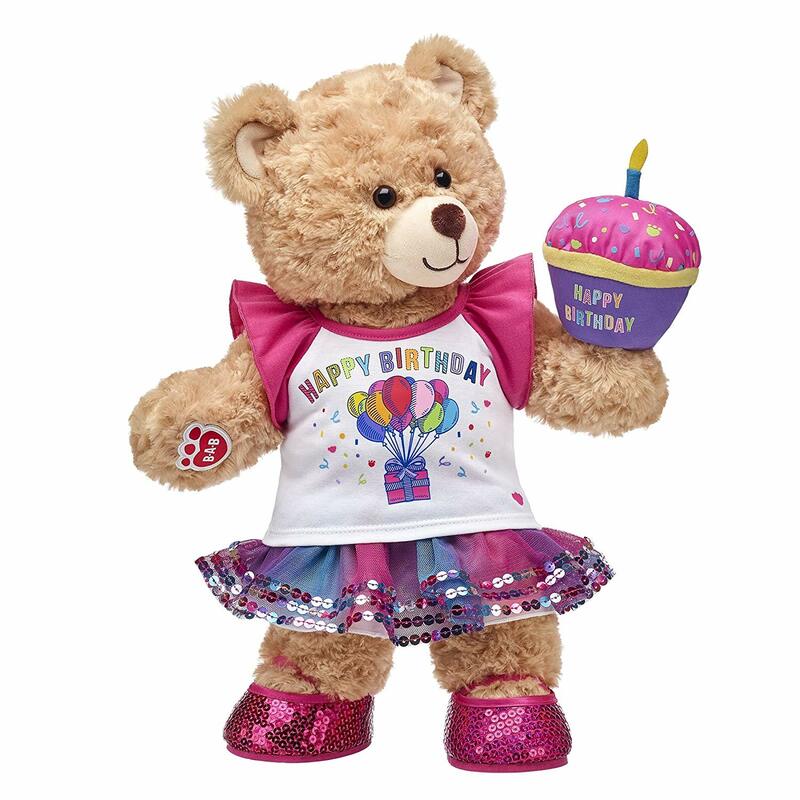 Gift this $47.00 teddy bear to someone you love! 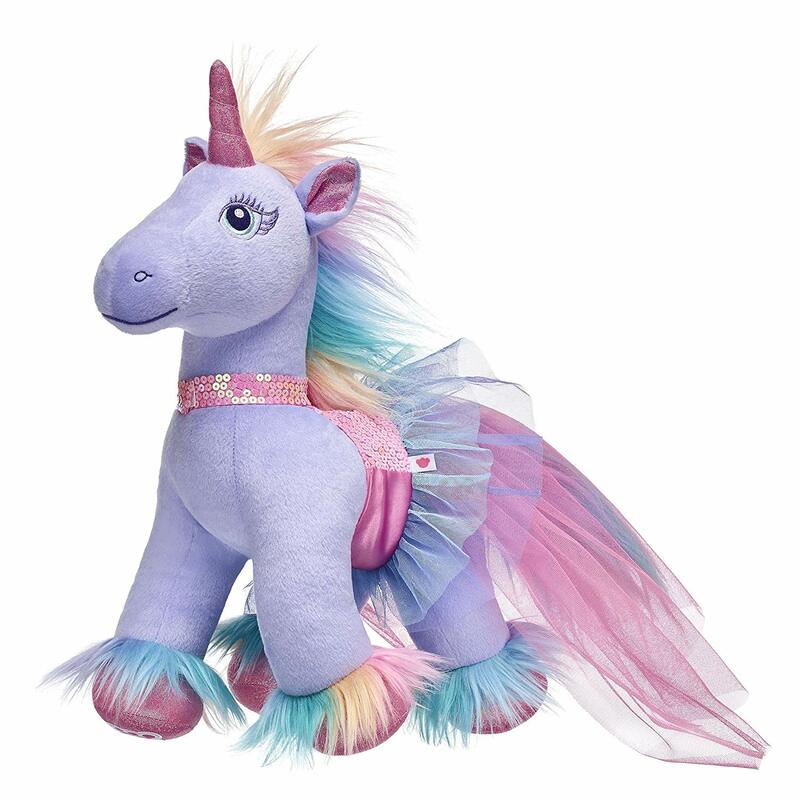 It's every little girl's dream to own a stuffed unicorn as stunning as this! This beautiful unicorn can be bought at $45.50. It comes with the dress of course! 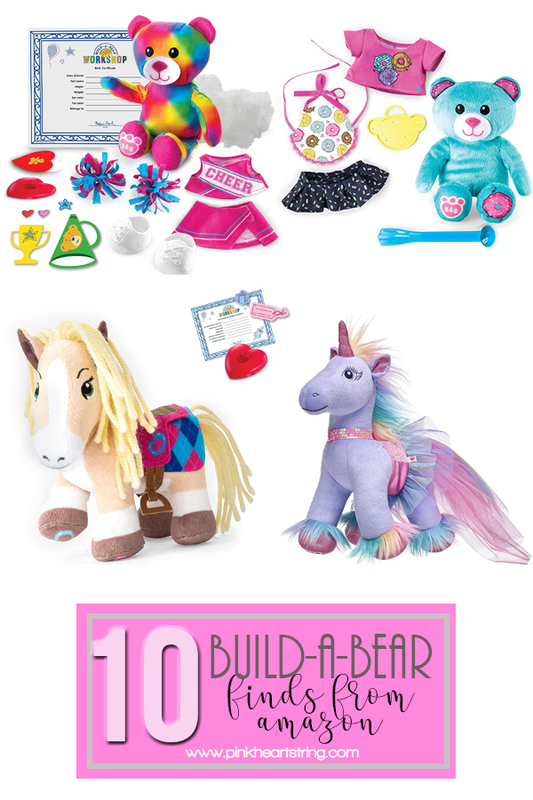 If your kids love Shopkins and Build-a-Bear, then this is the best gift! 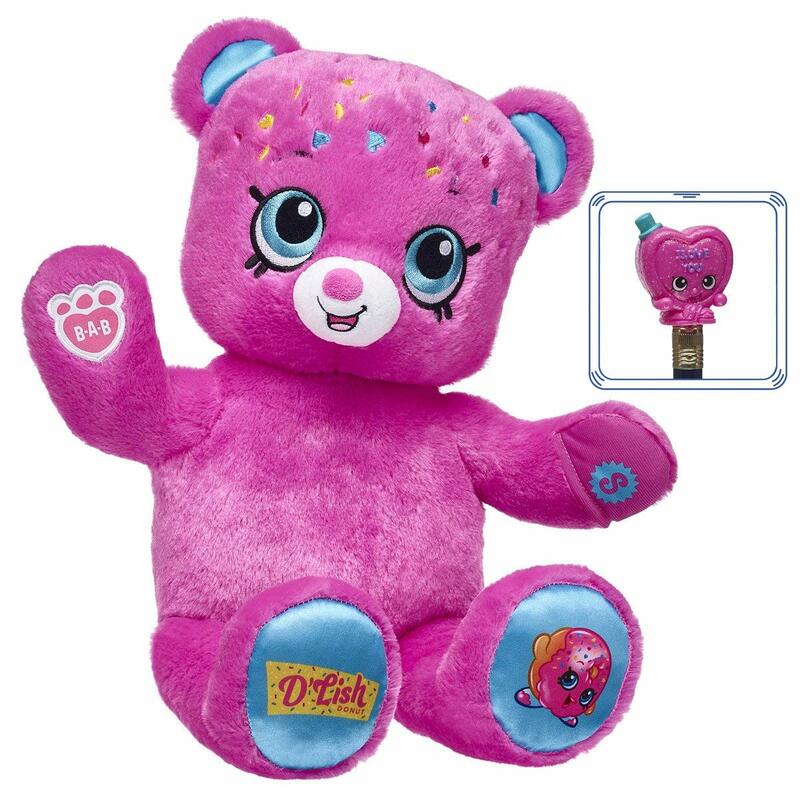 Aside from its Shopkins inspired look, this pink teddy bear also comes with a collectible Shopkins figure. Get it now for $33.00! These are all cute! Well, there are still more Build-a-Bear items on Amazon that you might want to check out. You would definitely be lucky if you could get the above items for $0.00 just by using your Amazon Rewards Visa Card. You can apply for a card at Amazon so you can use your $50 off on any purchase. You can also store reward points here which you can use in your future purchases! So, if you were not able to get an item from Build a Bear's Pay Your Age event today, it's okay! You can still buy one online anytime you want. However, I hope that Build-a-Bear will plan this well next time. Since the promo is for Bonus Club members, they should have sent emails to the members only. But maybe, one of their goals is to get more membership sign-ups. For sure, many parents signed-up so they can join the promo. I just hope that next time, the company will plan this well so that the parents and especially the kids will not get tired queuing for a very long time without any assurance if they can actually bring home a teddy. I can just imagine the disappointment of the children who were not able to get one! Disclosure: I am an affiliate of Amazon and I will be getting a small amount once you buy through my link. This will not affect the price of the items. But it will help my blog grow! Many adults live their lives with their phone in hand and eyes on the screen for the majority of their waking life. Awake and sometimes even asleep, we are constantly waiting for the next message, email, and even the occasional phone call to break into our lives. It is no longer an interruption of our daily routines. It has become the regulator of our routines. Now think about how scary it is that most of our teen drivers today have been influenced by these smartphones since the day they came into our world. They have never seen a pay phone. They do not memorize phone numbers at all, and some may not even know how many digits they would have to dial. The twentieth century may as well be a foreign land to them. ● Teens driving between the hours of 9 pm and 6 am are 40 percent more likely to be involved in a car accident. ● The highest ranking age of teens involved in a vehicle crash is 16 years old. ● In 2010, 33 percent of deaths among teens were due to severe car crashes. ● The two primary factors in teen car accident fatalities are speed and distractions. What can you do to protect your teen driver? The My Key, developed by Ford, can help you teach your teen to drive responsibly. 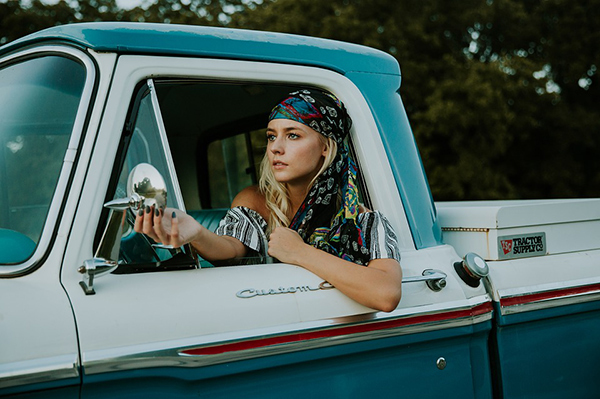 When your teen driver is operating the vehicle, the system can direct all incoming phone calls to voicemail, sound an alert until the front seat belts are fastened, and keep the car from going over the preset top speed. My Key prevents your teen from disabling the blind spot assistance and front collision alert. It can also be set to alert the driver when the fuel tank is getting low, to prevent them from running out of gas and getting stranded. This technology is just one of many ways you can protect your teen driver while they are on the road. Hyundai takes a more direct approach to protect your teen. They offer a system that monitors safeguards that you set for your teen driver. The philosophy behind Blue Link is that your teen will drive safer if they know someone is observing them. Rather than alerting your teen, it notifies you, the parent or guardian via email, text, or phone call. Your teen driver will also receive notifications on the car's dashboard. This technology is an internally installed extra. Hyundai includes Blue Link in most of its car models including Sonata, Genesis, Genesis Coupe, Veloster, Azera, and Santa Fe. ● Curfew Alert - When your teen is driving after hours. ● Speed Alert - When your teen exceeds the preset speed limit. ● Panic Button Alert - When your teen presses the panic button in the car. ● Geographic Alert - When your teen drives outside their preset geographic boundaries. 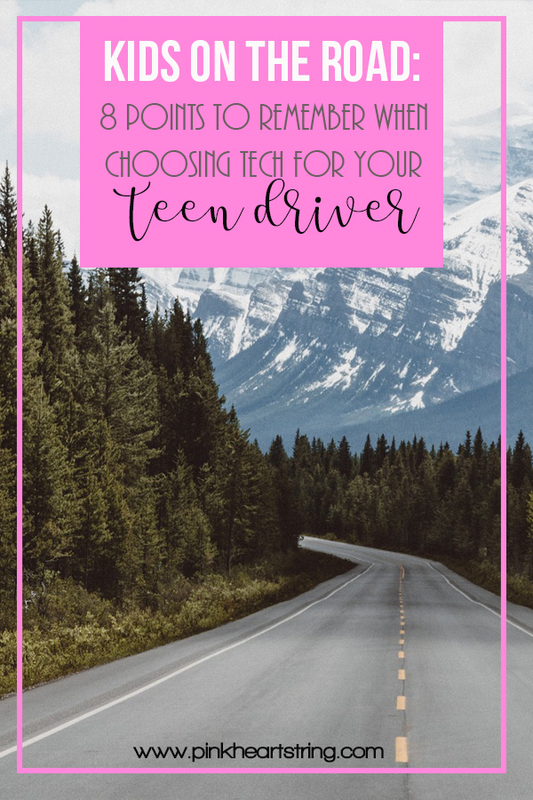 Chevrolet has equipped many of its newer models with Teen Driver: a built-in system that is designed to assist you with coaching your new driver. Chevy takes its safety philosophy about halfway between Ford and Hyundai. 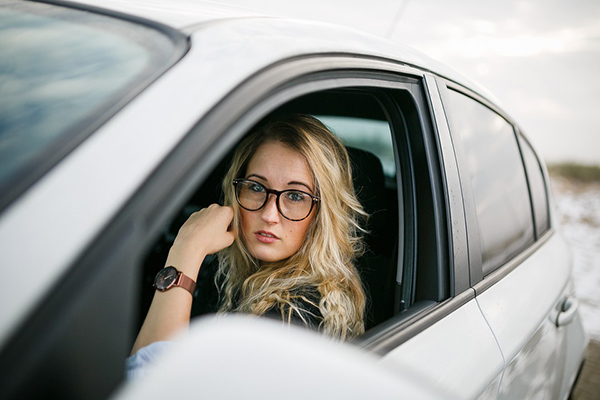 Rather than just alerting your teen, or sending you a message if those pre-set boundaries are breached, it keeps an in-vehicle report card of your teen’s driving over time. It is essentially Chevy's black box, and you can find it in most of Chevy's vehicles including Malibu, Cruze, Tahoe, Suburban, Traverse, Colorado, and more. ● Speed Alert - Whenever your teen surpasses the speed value that you set, they will receive an alert, and the black box records the incident in the report card. ● Volume Limit & Radio Mute -The Teen Driver system allows you to set a volume limit that your teen has to abide by while driving. Also, while the passengers in the front seat remain unbuckled in their seatbelts, the system will mute the radio. The concept behind the In-Vehicle Report Card is that it will help you monitor your teen’s driving, and make appropriate corrections with them. It tracks all the vital information such as the distance driven, anti-lock brake events, tailgating notifications, speed warnings, forward collision alerts, and much more. After viewing the in-vehicle report card, you can talk to your teen and help them improve their driving by correcting those problematic issues. If your teen does not drive a new car with lots of fancy safety features, do not fear. There are other means to help you tackle the challenges you and your family face about teen driving. If you use an iPhone, one of the easiest ways to keep your teen less distracted is to keep your phone on the new default "Do Not Disturb setting. It sends calls to voicemail and does not show incoming texts while you are moving at driving speed. It comes with the latest iOS update free, and it does not drain your phone battery while it is in use. TrueMotion is the phone app that mimics Hyundai's Blue Link system from a phone's perspective. 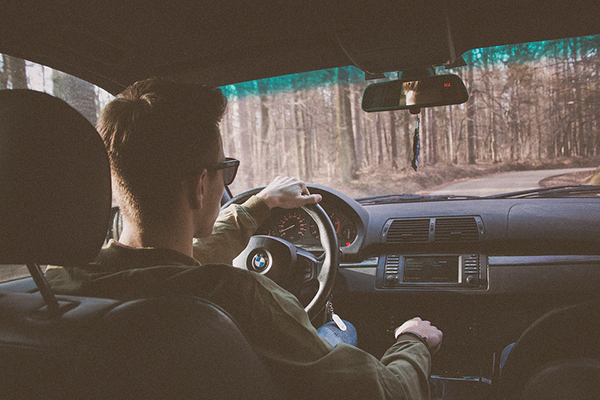 While it cannot measure brake usage, distance to other vehicles, or seatbelt safety, it can still monitor speed, curfew, and geographic boundaries for your teen driver. When your teen breaks one of those rules, you immediately receive a notification. This app is a favorite because it is simple, and it is also free to download and use. The biggest downside to it is that it is a GPS-based app and it will run your battery down quickly when it is in use. Volkswagen has a new app called the Car-Net App. This app finds itself halfway between the TrueMotion Family app and Hyundai's Blue Link system. This app syncs with their vehicle, allowing it to gain more information that is available with just a phone app. However, it only works on Volkswagen model cars built with this option in them. It truly is a vehicle/phone app hybrid system. The overall concept is the same as most other systems. If your teen breaks any of the rules you set for them, you will be notified immediately on your phone. This app is compatible with models such as the Beetle, Passat, Jetta, and CC. License+ is available on both Android and iOS devices and is a useful app that can help teens drive correctly. The app works with a plug-in called an Automatic. After you install Automatic to the car, the gadget sends essential information back to the app such as your teen's braking, acceleration, and speed across a span of days. You can then log into License+ as often as you like to monitor your young driver's progress. What separates License+ from the others is that it does more than monitor your teen's driving. It rewards them with achievements for safe driving, thus helping you teach them to drive well, even when you are not present with them. There are other variations of these technologies that can help you handle the issues about teen driving. We can take a hint from some of those overprotective parents who never wanted their child to leave the house without a safety helmet. While a safety helmet may not be the most critical piece of safety hardware you can buy for your teen, there are several items that you can use. The first is a phone mount for your dashboard. While it does not eliminate the distraction of messages popping up, it at least frees their hands from trying to hold the wheel and their phone at the same time. It also puts the phone in a place that passengers may operate it for your teen driver instead of themselves. The second item is a Bluetooth earpiece. These allow you to speak or dictate messages and emails without using your hands at all. These two pieces of hardware together can almost entirely free up the use of your teen's hands to drive instead of operating their phone. None of these things eliminate distraction from driving for your teenager. However, they all work to free their hands and focus their minds on the road at hand instead of the hundred other things vying for their attention. No method is foolproof or without workarounds by brilliant teens. However, finding something is better than leaving your teens to the mercy of the world's distractions. In the end, the best tool is an involved parent. Lead by example. Ride along with them and offer encouragement as well as correction. Take advantage of teachable moments. Talk to them about their friends who are involved in accidents. Show them how important safe driving is. Who does not like to be creative? Today, the world is filled with oodles of the creative minds. Roam your eyes, and in every door, you will find a creative mind. 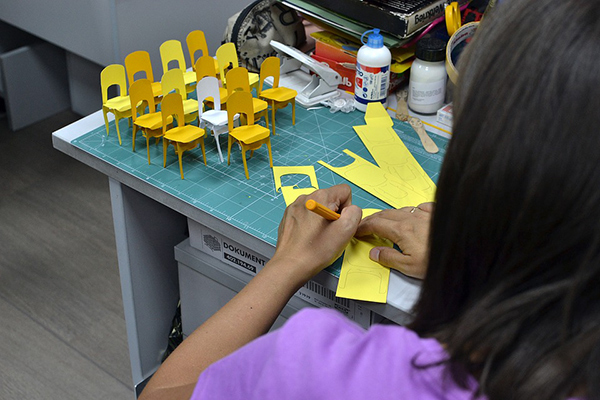 Don’t you think that your child possesses the caliber to create new things? If yes, then it is your responsibility to give him his desired wings to develop wisely and shine brightly. 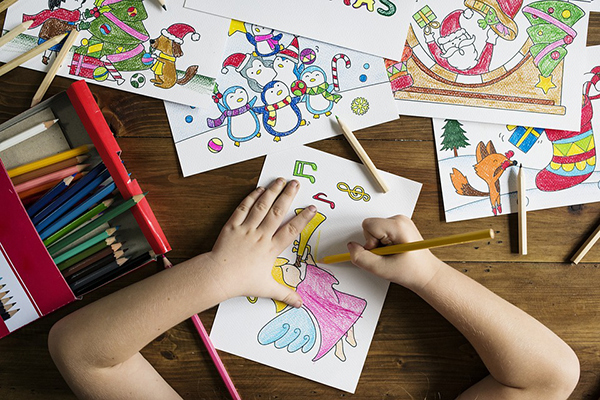 To explore few tips on how to encourage your child’s creativity, make sure you understand the concept of creativity. To describe creativity in one single word is ‘Imagination.’ To be more definition specific, creativity is designing something new and valuable. The concept of creativity is broad and inclusive of diverse domains such as the songwriting, dancing, writing, singing, origami, handicrafts, and many more fields. So, now the question that pops up is, how you can help your kid in this regard? 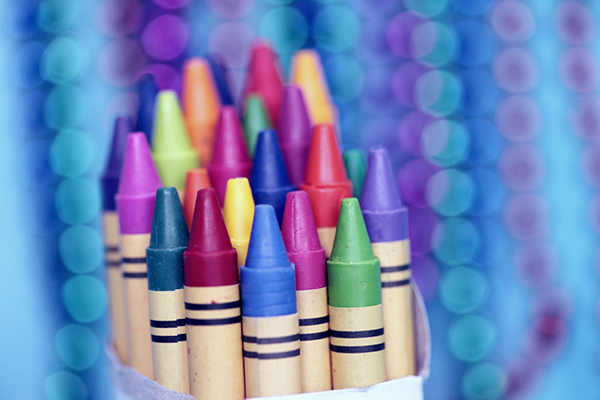 Listed below are top ways to encourage your kid's creativity. 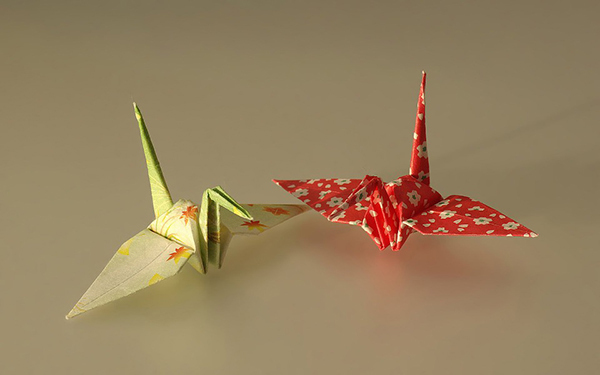 Origami is a Japanese way to encourage your child’s creative mind and indulge him in exploring the world of creativity. Origami is nothing but the art of creating wonders by little paper folding technique. It is also one of the enormous stress relievers for your child. There are seven types of the origami for your child to explore. It includes action origami, modular origami, wet-folding, Pureland origami, origami tessellations, Kirigami, strip folding. All these are the advanced version of the primary paper folding technique. Once your child engages in the art of paper folding, you may enroll him to learn professional origami techniques. You can even explore more origami diagrams by visiting Origamiway.Com. The fundamental support for a child to express his creativity is to give him his leisure time. Kids are at such a stage where they need ample of time to be creative. Also, for an ‘ME’ time, they do need your time to guide them. Gift them with your guidance and availability and watch them clinch in the maximum success. After a time, the kids need their space. By space means, if you have a creative child, he is going to mess up your house. Give him his liberty to create anything, and in any way, he wants. By your encouragement, the child will start engaging himself in boosting his caliber for creativity. Art is a field where the child needs a boost from the parents. Imbibe different cultural ideas in the mind of your child and increase his enthusiasm to participate in the cultural programs. To accomplish this, let your child participate first in the local cultural programs and later through each educational institution. Raise his zest to explore more and more from the cultural activities and see your child prospering in the creative field. Ask your child to come up with a unique solution to one of your family problems. Give him the liberty to think as he wants. For example, you may involve him in decisions such as choosing the next color to paint your house walls or else ask your child about the messy room and how to clean it? Let him come up with the childish answers. Appreciate his patience to think, rationalize and find a solution to the problem. This will inculcate his problem-solving ability in a positive way. It says that the child reciprocates his parents. If you wish to see, your child increases his creative thinking, participate in playing with them. Here you need to focus on their lead. Let them take the lead in the game and rule like a leader. Do not pamper your child to win every time. Instead, observe his behavior how he manages his failures. It will foster a sense of leadership qualities in your child. It is a symbol that you support them to take the lead and prioritize their creative space. Do you love art? 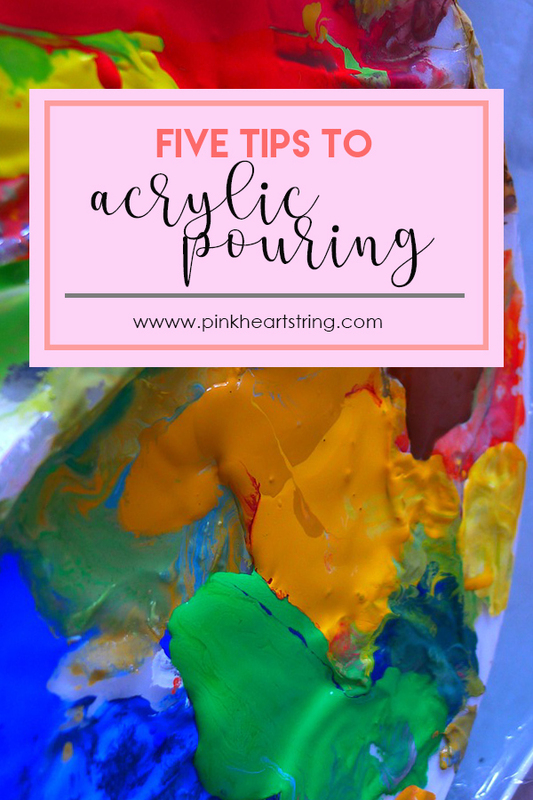 If you do, you would love this post today especially if you are into acrylic pouring. This is a technique used to paint by pouring different colors of acrylic paint on a canvass. For sure, you have seen some works like this on social media since it is a hit for art lovers and the result of acrylic pouring is really impressive. If you want to try this kind of art, there are some things that you need to take note of. You definitely want your acrylic pouring to give you consistent results. Although it seems simple, acrylic pouring is not always easy. You will need practice and use of the right materials to get that great artwork you desire to create. To make it easier, here are a few tips to guide you in acrylic pouring. You can also learn from acrylicpouring.com for more tips. 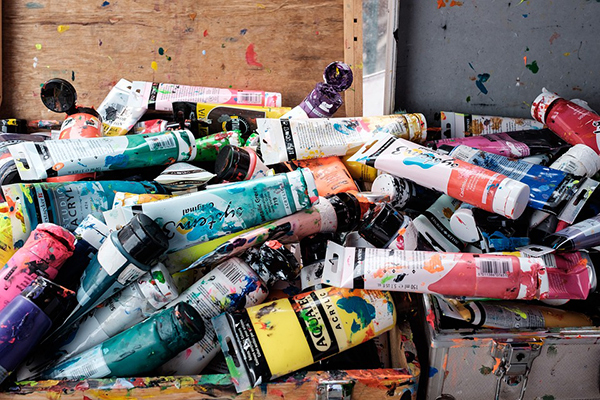 The condition of your studio may determine if you get successful pouring. Therefore, make sure you clean the studio so that dust does not embed into the film as it dries. Remember that acrylic pours take time to dry. Also, ensure that you are working on a leveled surface, whether it’s a table or the floor so that the pores do not have issues because of angles. Protect the surface from drips and puddles that come from the pouring products by placing poly plastic sheeting on the surface. The sheet will also prevent your artwork from gluing to the surface. You should also control the humidity and temperature of the studio to ensure issues such as crazing that is caused by dry conditions do not occur. Paints and mediums play a critical role in acrylic pouring. The pouring process depends on the paints and mediums. The most important part is to adjust the flow rate and the viscosity of the paints depending on how you want them to interact with each other. Some of the best paints for acrylic pours are high flow acrylics and Golden fluid acrylics because they have high viscosity. You can also use heavy body paints, but you have to thin with acrylic medium, water or both. For instance, if you want to thin heavy body paints and without losing film strength, you should mix the medium with water and then use the mixture to thin paints. You can use 1.5 parts water and 1 part medium. Note that the water additions should not be more than 40 percent. Your painting substrate will determine if your acrylic pouring is successful or not. A sealed panel is commonly used for pours since the weight of the wet paint affects it less because it is rigid. To ensure that the panel does not warp due to water, seal the surface with a coat or more of the paint or of the acrylic medium. In case your pouring technique requires an absorbent surface and /or a substrate that can curve, then you should go for stretched canvas. Ensure you prop the center so it does not sink. Stains can interfere with the look of your acrylic pouring. To prevent them from getting to the surface, apply a stain sealer and prime with gesso. Once you are done with your acrylic pouring, leave it and let it be. Some of the most amazing work of art resulted accidentally after being left to settle. Too much prodding by moving the flow too much can make things worse and break cells. You will end up messing your artwork instead of making it better. 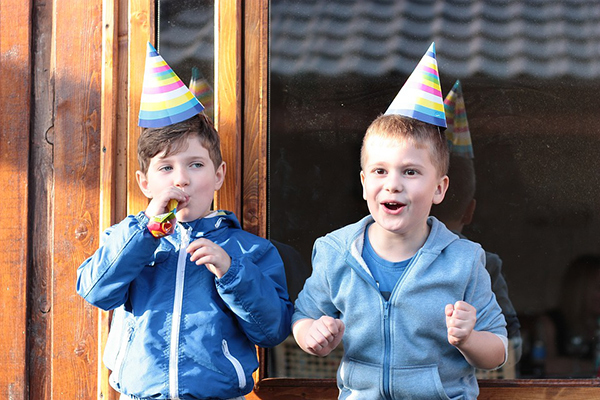 All parties are special, but there's something extra-exciting — something almost magical — about kids parties, and furthermore, most adults want to make these parties as riveting and memorable as possible. The trouble is that doing so can prove challenging, especially when the responsibilities associated with sending invitations, ordering food, selecting a venue, and setting up are considered. 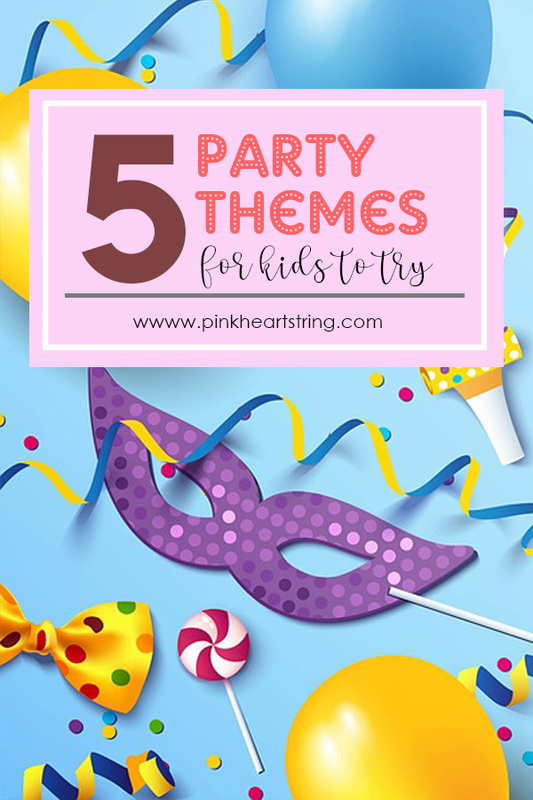 The following five party themes for kids are sure to impress all those in attendance (including the adults!) while alleviating some of the stress of the planning process. 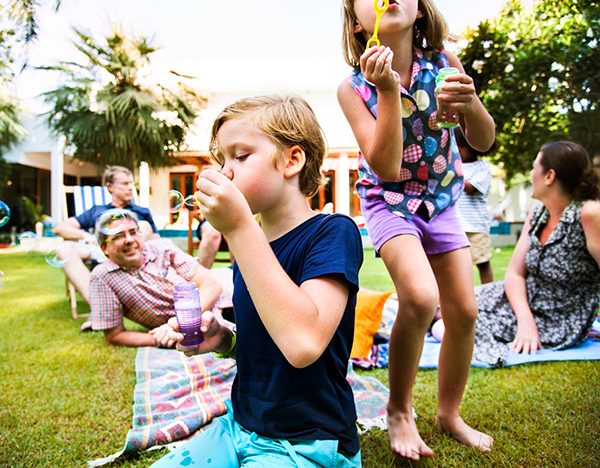 Outdoor kids parties and gatherings, and specifically, those with a treasure hunt and/or animal safari theme, are arguably more popular (and beloved by children) than ever before. The reasons so many individuals get excited for outdoor kids parties like those described aren't difficult to understand: the sun is shining, there's plenty of space to run around, there's more room for games to be played, and interacting with all the guests is a breeze (because of the open layout). 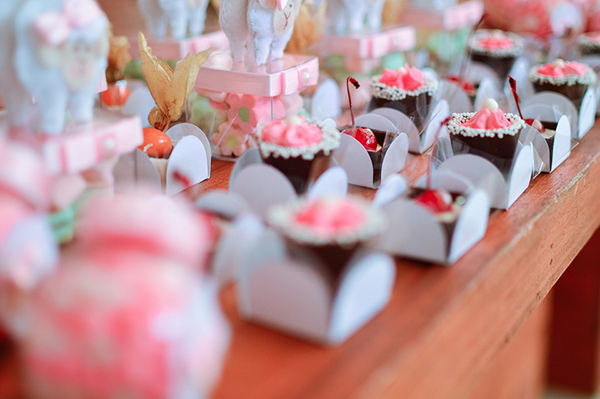 To throw a successful treasure hunt/animal safari party, consider hiring an animal-handling professional (who will showcase a variety of creatures for the guests to see) and/or arranging a treasure hunt, or a pre-planned, adult-led search for a prize (probably candy!) that the kids conduct by collectively responding to clues and suggesting plans of action. Appropriate decorations will also add to the strength of the theme. Game-themed parties are all the rage today, and for good reason—nearly every single individual on earth loves playing games! Furthermore, the open-ended nature of this, one of the most beloved party themes for kids, means that planners can arrange their parties as they see fit; each guest can bring a board game, a variety of video game consoles can be set-up, games that can be played by all the guests simultaneously can be arranged, or some hybrid of these choices can be settled upon. Whatever type of game(s) a party planner decides upon, it's important to remember that this theme almost always brings fun. Balloons are timeless; they've been integral ingredients in the recipe for successful parties for countless years, and it looks as though they'll continue to play the role for quite a while to come. Why, then, shouldn't a kids party capitalize on this near-universal affection for balloons by making them the central party theme? Balloon Bonanza parties are made possible, it should be noted, by the fact that the helium tank takes the hassle out of party balloons; party planners won't have to spend an arm and a leg on balloons or dedicate all their time to inflating them, if they have a helium tank, as the tool is capable of inflating a stunning number of balloons in a short period of time. Consider offering prizes for "winners" in games such as balloon bounce (or a contest to see which guest can bounce his or her balloon in the air the longest), balloon pop (who can pop the most balloons in a minute), partner balloon bounce, and more. Today's drones are more capable and affordable than those of the past, and as such, it's possible for party planners to spend the same amount on a fleet of introductory drones (complete with functional controls and HD video capabilities) as they would on a party center, replacing the latter setting with a backyard. Races, trick competitions, and simple high-flying adventures are sure to entertain attendees at a drone-themed kids party. It should also be noted that the drone has become one of the most exciting party themes for boys and one of the most exciting party themes for girls; each and every child, as well as his or her guests, can have fun with the aerial machines. Last but certainly not least, winter party can be based on a Winter Wonderland theme. Such parties include snow-themed games (snow-painting, snowman building contests, snowball fights, and perhaps sled riding, if the setting permits) and plenty of hot chocolate and indoor time. With that said, these celebrations also make the most out of the cold and encourage children to enjoy themselves while playing outside—something more and more kids seem to be opposed to doing. 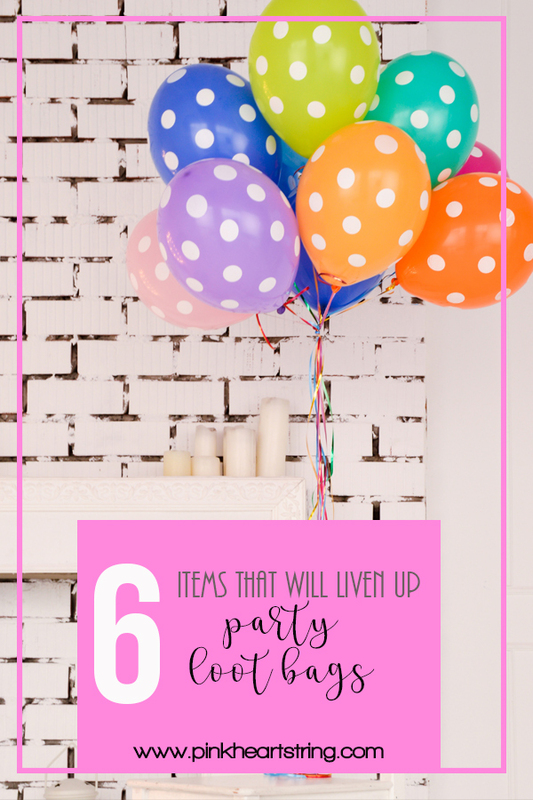 These party themes have been big hits for an abundance of kids, and there's an awesome chance they'll also impress you, your child, and your guests. Thanks for reading and good luck! If you want to teach your children to value nature around them and take it seriously, there is no better way than introducing them to the wonderful world of gardening from a young age. Besides, your kids will love to get their hands dirty and play in the mud. They will also have the opportunity to learn valuable new skills and facts about greens while having fun. The best part about gardening is that it doesn't actually require large, sunny backyard. 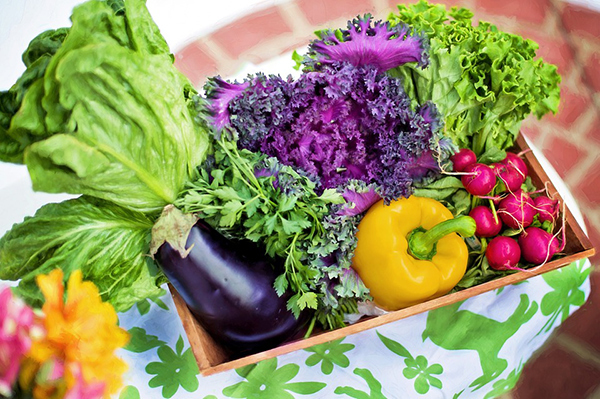 You can create a small garden in a raised bed on your balcony or you can incorporate just a few plants - veggies in an existing landscape, i.e. in the corner of your outdoor area. Herbs, for example, are very easy to grow and need just a container, quality soil and a sunny spot so they are perfect if you don't have much space. Also, planting edible vines on a trellis placed against an outside wall of your house is a great solution for the gardeners lacking space in their outdoor area. 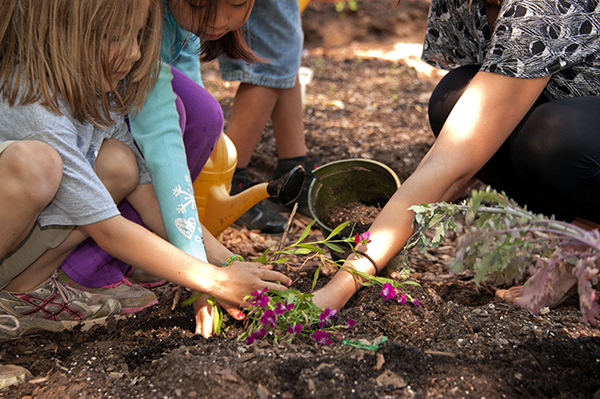 Get your kids involved by explaining them the process of planting, (which we can refer to as the cause-and-effect) where they will learn how to be responsible, learn to understand and appreciate nature and become aware of where the food comes and how much effort you have to put into producing healthy food. Show them what it takes for a seed to grow, what happens from the moment you plant it until the fresh veggie on the table. Make gardening a family bonding activity; teach your children how to plant sweet cherry tomatoes that they are going to love eating straight from the garden! 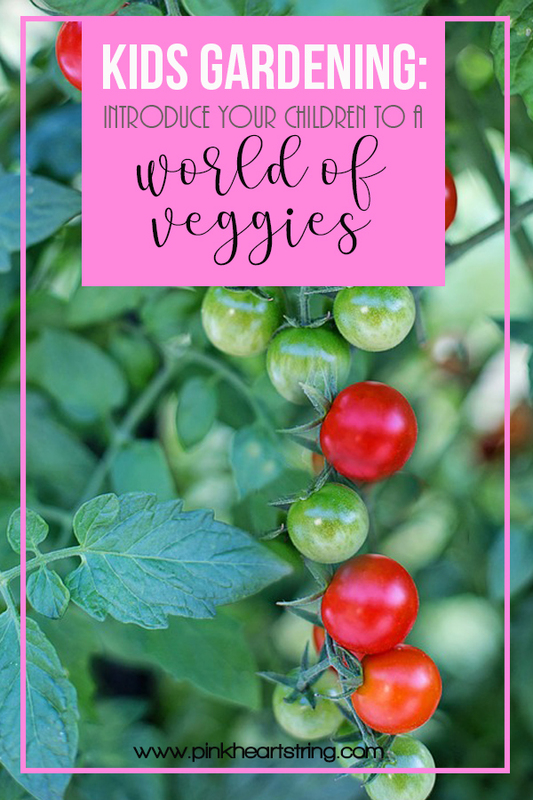 Opt for veggies that are easy to grow without a lot of fuss such as radishes or zucchinis and explain how you are going to enjoy the fruit of your labour because they are a great return on your investment. Speaking of returns, you will also see how gardening can affect your child's body, brain, and soul. It does sound pretty easy, but keep in mind that gardening is a lot of work and it can get really messy sometimes. There are many things that are out of your reach that can affect your wonderful garden, such as pests or weather but at the end of the day, you will feel it was all worth it. You will have to go slowly to make sure your children are following your step-by-step planting process, invest in quality garden equipment, fertilize the soil (with compost obviously), and protect the plants from the insects and pests. You will see the benefits it has on your children - you will see them patiently nurturing their plants and you will see the look of satisfaction on their faces after they realize they've planted those cherry tomatoes and happiness with how sweet they taste. That will boost their confidence and teach them to appreciate the nature that gives us food. Plus, gardening is a great physical activity that will keep them healthy, happy, and exhausted just in time for the afternoon nap. These are all simple things you can intertwine in your daily routine and create a great outdoor activity for your children. Teach your kids to be responsible and water regularly, harvest fruits and veggies, take care of weeds, learn how to compost and prepare the soil. They will fall in love with nature and understand why we should take care of it, why should we become even more eco-responsible. And the most important of all, they will have so much fun gardening! 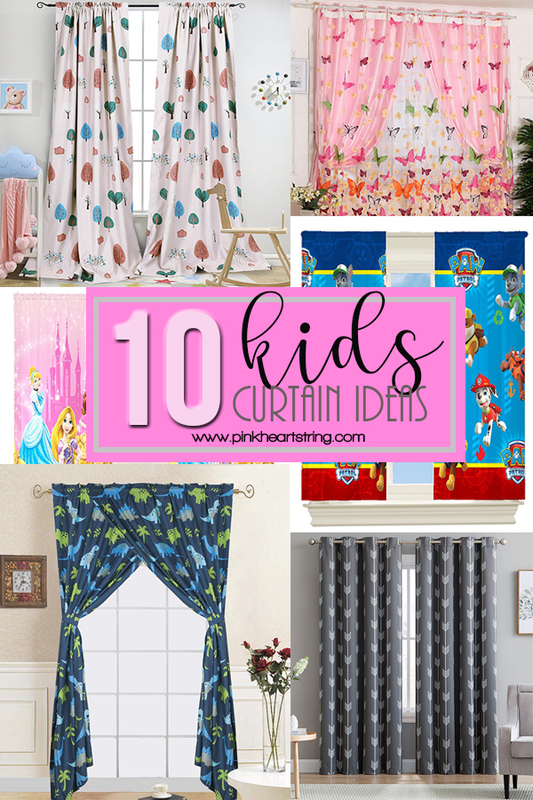 Are you looking for kid's room curtain ideas? Well, there are so many options available. But of course, you can't just pick any curtain! You have to make sure that it compliments the rest of the bedroom's features. Let your child decide on the bedroom's theme then help him or her choose the decorations and accessories. This includes the table lamp, curtains, wall decors, area rugs, and others. But today, we will give you some kids blackout curtains that you can choose from. For sure, you can find one that will best suit your child's bedroom. 1. Cute Animal Print Curtain. 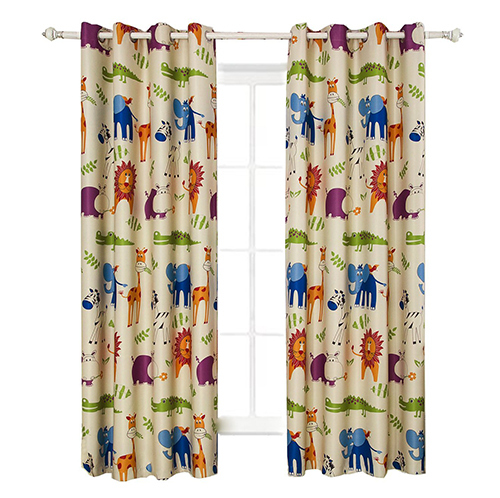 If your child loves animals, get a Safari or jungle themed bedroom by adding this curtain. 2. 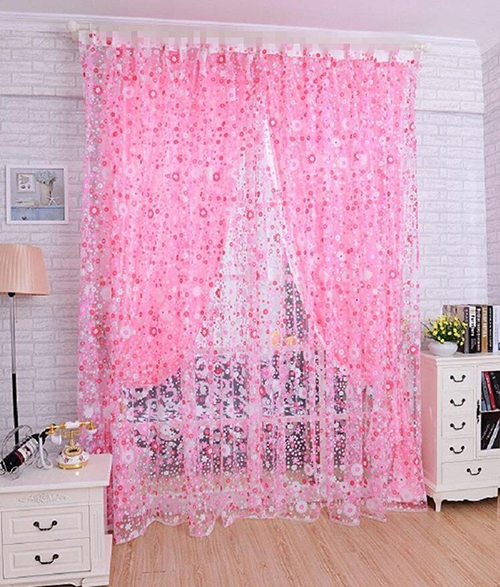 Pink Floral Bedroom Curtain. 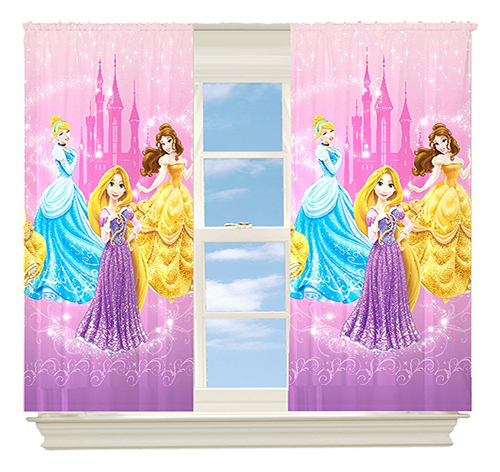 For your little princess, a pink curtain would be perfect! This curtain brings a feminine touch to the bedroom with those lovely flowers.Or you can also add green curtains with leaves which will add a touch of nature's beauty into the room. 3. 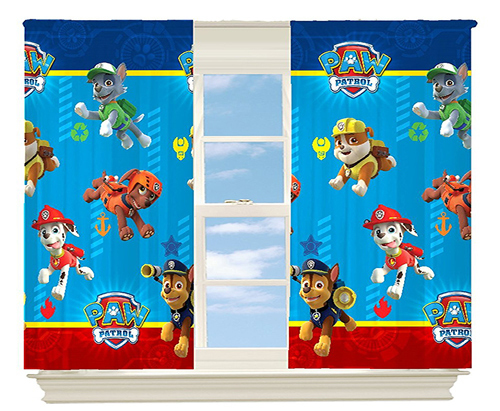 Paw Patrol Paw-some Room Darkening Window Panel. For kids who are fans of Marshall, Skye and the rest of Ryder's rescue team, this would be the best choice. 4. Disney Princesses Grand Beauty Room Darkening Panel. This is a must-have for every Disney Princess fan! A bedroom will not be complete without this. 5. Romantic Starry Sky Blackout Curtains. 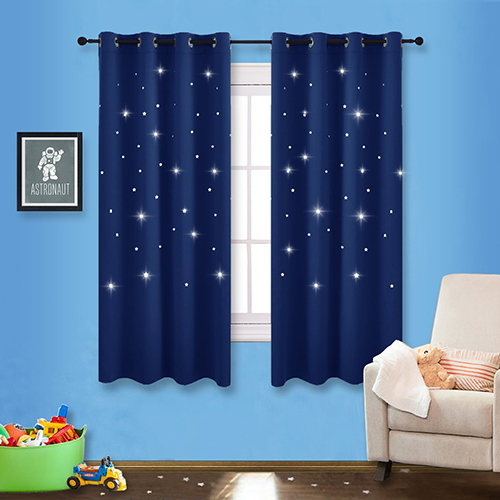 This curtain will give your child the feeling that stars are falling into his or her bedroom! 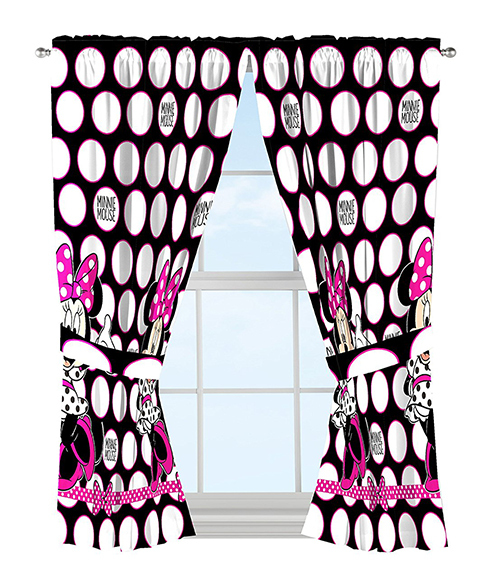 There are also other versions of curtains with stars. It comes in baby pink and even gray. 6. Disney Minnie Mouse Dots Curtain Panel. Another one for Disney fans is this Minnie Mouse curtain. Just imagine having everything Minnie Mouse in the bedroom! It would be so awesome! 7. Dinosaur Curtain. 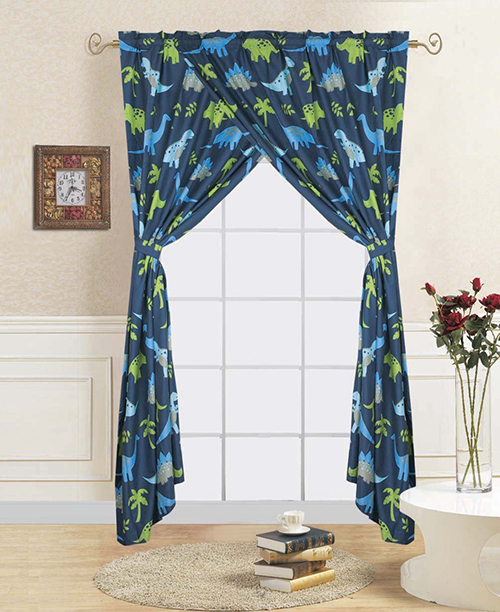 Your kids will roar with joy if you add this cute dinosaur printed curtain in the bedroom. 8. 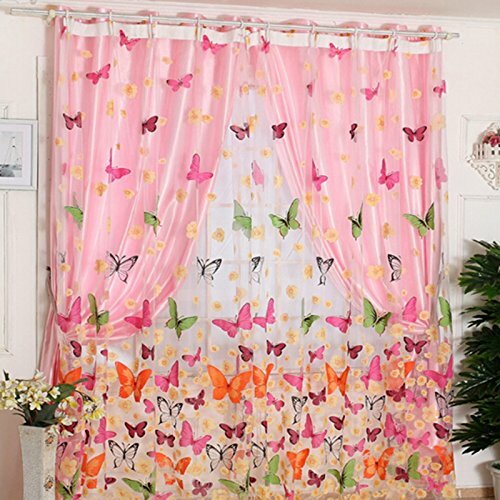 Butterfly Window Curtain Panel. 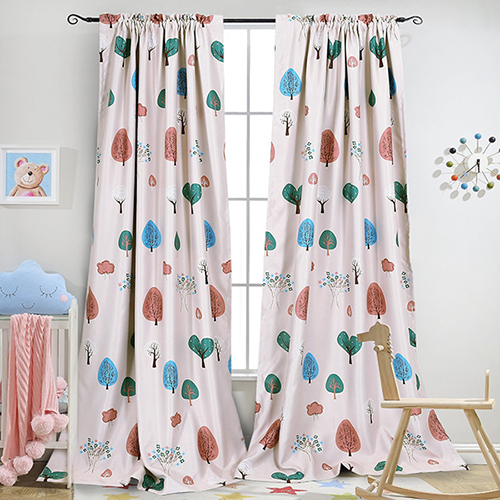 This sheer curtain with butterfly prints will make your kid's bedroom like a wonderland for fairies! 9. Cartoon Trees Curtains. Speaking of wonderland, this could also be a good one too to achieve that theme. Add some mushroom printed throw pillows or ottomans to complete the look. 10. 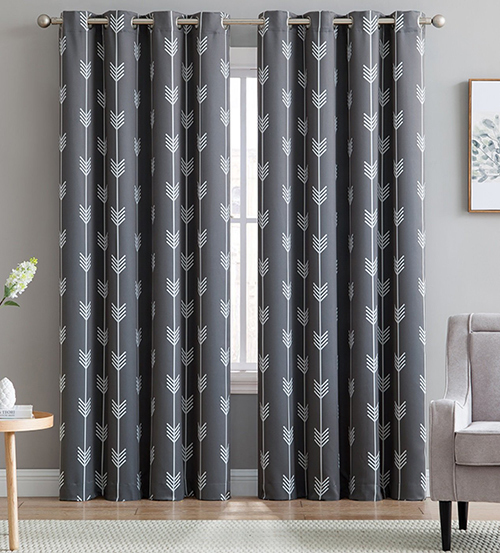 Arrow Printed Blackout Curtain. I could imagine a Scandinavian bedroom with a curtain like this! 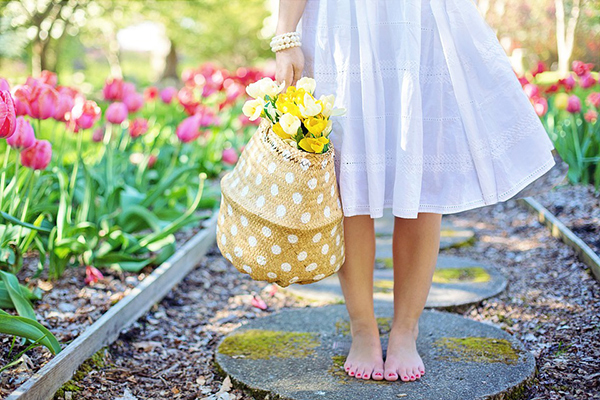 Complete the look with a teepee! Disclosure: Affiliate links included in the above post.